Remote Tools is an Android app that will let you interact with your Windows PC via your WiFi connection. 1. 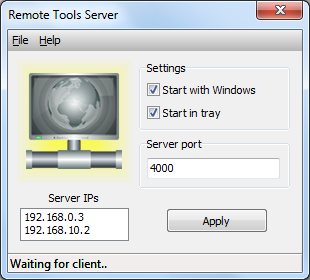 Remote Tools Server. Available for Windows 32-bit or 64-bit. 2. 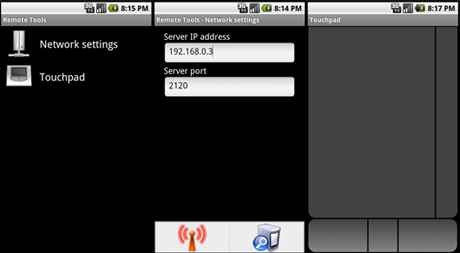 Remote Tools Android App from Google Play. Note: The download links for the Remote Tools Server have an interstitial ad. Simply wait 5 seconds until the skip button appears. Click skip and your download should then start automatically. 1. Download the required software from the links above and install it. The server software doesn't need to be installed. Just extract it to a convenient location on your Windows PC and run it. 2. When you run the Remote Tools Server, you will see a yellow background showing that the server is ready and waiting to receive data. If the background is red, the most likely cause is that the port is already in use. If you change the port number, click apply and the server will be restarted. 3. To use the PC discovery function in the app, UDP port 3120 must be fully opened in any firewall you have. This is a convenient search function that will automatically detect all Remote Tools Servers running on your network. The server port that you selected in step 2 must also allowed to receive incoming data. You can either do this manually or wait until the firewall asks you at step 4. 4. Now that you have the server up and running, start the app on your Android device. Select Network settings and you'll be presented with input boxes to enter the server IP and port number. You can enter this information manually, or more likely you'll want to use the PC discovery function. Press the menu button and select the search icon on the right. This is where the firewall on the Windows PC will ask for permission. A few seconds later you'll see a list where you can select your desired server. If the server doesn't show up in the list as expected, check that you've completed step 3. When the server has successfully received data, the background will turn green and the client IP address will be shown in the status bar. 5. Once server info is set, you can go back and start using one of the tools.